Divayth Fyr is a powerful Dunmer wizard searching for a Daedric artifact in the Clockwork City. He can also be found inside Tel Fyr, near the entrance to the Halls of Fabrication trial. He has recently gained ownership of the tower, but has met unexpected issues during the shaping of the tower and needs your assistance to investigate the problem. Forging the Future : Stem the tide of fabricants before they overwhelm Tel Fyr. The Telvanni decided to honor me with membership in their great house. This tower was their idea of a gift. Their choice of location was... portentous, let's say. For them. My own auspices are far brighter. "I'm a traveler. At my doorstep, a new path. The natural conclusion should be obvious. I intend to explore beyond the rift that has emerged in my basement, or rather, the caverns beyond; however, none of this lot are willing or able to join me." What exactly do you need accomplished? "Upsets in planar demarcation are remarkably complex. Study must be free from distraction. An impossibility while constructs continuously spill from the rift. We must find their source and shut it down." Understood. Where do we begin? "Clear a path through the meddlesome machines in the cavern beyond this antechamber. I will join you at the rift once I've completed my usual transliminal preparations." What kind of constructs are we dealing with? / You mentioned constructs. What kind? "Some are Dwemeri. Tinkered with in ways beyond even my experience. Intriguing, but not nearly so interesting as the fabricants. Their marriage of the organic and inorganic defies all contemporary wisdom. But are they as they seem?" "What indeed. I'd only heard descriptions of the creatures in my talks with Barilzar, Sotha Sil's former apprentice. Even he doesn't seem to have a full grasp of their design. They are life driven by clockwork, if all is to believed." Do you know where this rift leads? "Given the eruption of fabricants into the caverns, my theory is it somehow intersects with the Clockwork City. Anything beyond that is pure speculation." "The domain of Sotha Sil. A world of his own design. Privilege of being a god. Whether it exists in Nirn is the subject of much conjecture. Perhaps we'll finally lay that debate to rest." "I'd assumed you knew whose home it was you were standing in. Divayth Fyr. Does that name's significance escape you as well?" No, actually I'm a fan of your writings. "Then you should be honored to see my work first hand. I'll make a note of your contribution to my next book, posthumous or no." "A woman of taste. I would offer a private reading, but as you can see my new home is not fit for company. Perhaps after we've finished our sojourn in Clockwork City." "For your sake, I hope you're more prepared for what's to come. As for me, you could say I am a practitioner of magic. If you were partial to understatement. I am the premiere authority on extra-planar travel. My writings are taught the world over." "The realms are bleeding together around the locus. Not unlike the Planemeld. We must stabilize the rift before it drags anything else through." "This structure has some hold on the rift, or the other way around. I'll investigate while you finish up down there." "The energy arcing between those fabricants is strong. Enough to dissipate flesh... or melt metal." "A surge in the rift! On your guard!" "The automata are reacting to it! Shut them down!" "Interesting. These devices have all reset themselves. I didn't do that. Another surge in the rift. A big one! Prepare for the worst! There! Somethings [sic] coming through! Another fabricant! Oh! That's a new one." "The constructs are up to something. They're empowering that fabricant!" "A few of you should get up here and deal with this." "There. Stand on those levitation sigils. I'll see you momentarily." "You should go. Quickly. Use these Slowfall sigils. I'll be fine." "Never seen liminal backlash of this magnitude. Marvelous." "More constructs! Use my sigils!" "They're at it again. Better get up here." "I almost have it, but that fabricant is still resonating with the rift. Destroy it! Quickly!" "That energy is just like what was arcing between those fabricants before!" "Get up here, before they destabilize the rift entirely!" "What are you waiting for? Use my levitation sigils!" "The rift is stable. Let it not be said that there was a portal I could not tame! Now, my old friend, what inspiration has divinity brought you?" Divayth Fyr: "Ah! There you are, finally! I've had my fill of rooting through garbage while this lackwit drones on." Assembly General: "Reprocessing yard contamination critical. Disassembly status suspended. Mass reactivation initiated." Divayth Fyr: "Fascinating―Look! The scrap heaps!" "They're channeling energy throughout the junkyard... and it's reacting." "They're reviving fabricants! Highly unstable. Deal with them quickly!" "Their systems are beyond taxed. Reforming their circuit could overload them entirely!" "These fabricants are forming a circuit. Breaking those links may weaken them." "It's gone haywire! Damaging the others should cause a similar reaction!" "Besieged by garbage. A new low." "Sever their connection, or are you trying to do this the hard way?" "Their circuit is active again." "The junkyard is stirring. Be wary!" "You mustn't allow them to cooperate!" "More shambling refuse. Cease that clatter!" "The fabricants are getting up again. Durable, if nothing else." "They're dangerous in that amplified state." "Their conductivity is impressive, but not without drawbacks. Use their power against them!" "One of them is overcharged!" "They're at their limit! Link them!" "It's charged beyond its capacity." "It's channeling tremendous amounts of energy." "That's all of them. Now trigger a surge!" "That's it, now push them over the brink!" "Discharge that energy! Direct it against them!" Divayth Fyr: "Are you listening, construct?" Assembly General: "Query denied: Creator not found." Divayth Fyr: "Close enough. We're coming for you, you chattering collection of cogs! We may find something helpful in this workstation. Draw its attention elsewhere. I'll catch up." "Were you confused as to your purpose in this endeavor? Stop that incessant machine's prattling." You know how to operate that terminal? "I know how to operate a myriad of things quite similar. Buy me time, as I've already asked―twice―and its secrets will not stay hidden for long." "A means of silencing that infernal machine and ending this threat without turning the entire place into a heap of smoldering wreckage. That would be easier if you went about the task I gave you." You don't seem very concerned that this place is a death trap. "You aren't here for my safety. You're here to help me defuse the situation without resorting to mass disintegration. If you refrain from dying―and stop pestering me―we may yet accomplish that." Divayth Fyr: "Well, well. Now that's the second largest construct I've ever seen. Inactive, at the moment." Assembly General: "Initializing internal scan." Divayth Fyr: "I expect that will no longer be the case shortly." Assembly General: "Organic contamination detected within control center." Divayth Fyr: "Aha! There's its cogitation array, in the distance. Keep the body distracted while I unravel its mind." Assembly General: "Assuming manual control. Surrogate avatar... synchronized. Divayth Fyr: "I'm sure you'll do fine! I'll yell if I need anything!" "The secondary terminals are attempting to compensate! Give them a whack!" "It's bypassing my alterations! Disrupt the secondary terminals now!" "Finally. Quiet. Now, to study this mechanism in peace." "What secrets do you hold of your creator's processes, hmm?" "It will take years to sort through this information... though perhaps I can repurpose an animunculi to sift the archives." "Nothing of the scale of what we've seen here. A harmless little spider, perhaps? Or maybe something with a face? It'll need more personality than this one possesses." "Translocating all this material will require considerable―yes?" "Hmm? Oh, yes. With this machine shutdown the threat to Tel Fyr is contained. Keep whatever valuables you collected as compensation." "Hmm? Oh, yes. With this machine shutdown the threat to Tel Fyr is contained. Consider these treasures reward for your assistance." "Hmm? Oh, yes. With this machine shutdown the threat to Tel Fyr is contained. Take this as thanks. I could not have asked for more capable assistants in this endeavor." "I will open a portal from here to allow you to exit. I'll linger here a while longer, but you needn't concern yourself with my safety. If you ever find yourself near my tower, do stop by. You're entertaining. Capable." Why didn't you open a portal earlier? "In all my thousands of years, how didn't I think of that? Translocation does not work by your whims and desires, or even mine. Be glad you needn't traipse through half of Oblivion searching for your point of origination." Was this thing the cause of the rift? "No. Intelligent as this machine is, it lacks the awareness to create such an event. It was simply attempting to cope with the anomaly. That does not mean there are not answers to this phenomena here. I intend to find them." It's been an honor, Master Fyr. "Doubtlessly. However, I'm afraid I have no further need of your brand of assistance at the moment. Would you be on your way? You're becoming a distraction. You know my opinion of distractions." In the Tribunal Temple, where you were instructed to meet Fyr. Divayth Fyr: "Ah, you've arrived at last. Come forward, we have much to discuss." If no other prerequisites have been met "The future holds its secrets close, but I have scryed glimpses. Your spirit strides alongside those of anointed kings and heroes. Trust me - you walk the path to power. If you've escaped from the clutches of Coldharbour. Soul Shriven in Coldharbour completed "You escaped the prisons of Coldharbour. Truly, I think it would be easier to escape an iron safe at the bottom of the ocean. You show great promise. I can use a slippery warrior like you." If Molag Bal has met his match in Coldharbour. 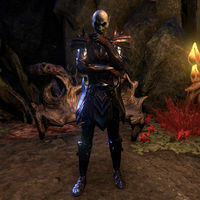 God of Schemes completed "You bested Molag Bal in mortal combat. In Coldharbour no less. Defeating a Daedric Prince in his own realm? That's a feat that even I would have trouble repeating. Only a great fool would pass up the opportunity to employ a Prince-slayer." Long Live the King completed "That business in Orsinium - you were one of King Bazrag's most powerful advocates, yes. I need someone who can fight and parlay with equal skill. As a warrior and kingmaker, you will do splendidly." Prison Break completed "Did you not unite that rabble in Abah's Landing and reassemble the Thieves Guild there? Oh, don't make that face. I have no interest in reporting you to the authorities. Quite the opposite. I need someone willing to take risks. You will do nicely." Filling the Void completed "Nightmarish fabricants and automata lurk in nearly every corridor of the Clockwork City. I need a skillful and deadly warrior at my side. A Silencer of the Dark Brotherhood fits that description splendidly, don't you think?" Divine Blessings completed "You saved the life of a living god. Yes, I know all about your service to Vivec, and your conflict with Clavicus Vile. Forging the Future completed "I have not forgotten our romp through the Halls of Fabrication. Of Knives and Long Shadows completed "I have no great fondness for that Psijic, Lilatha, but you saved her life and defeated a powerful shadow mage in the process. A remarkable accomplishment for someone of your... breeding. I'm confident you will continue to surprise me." "Prepare if you must, but make it quick. Time is not on our side." "There you are. Come! Here, behind the waterfall!" "Divayth Fyr:' "Luciana Pullo. Hospitable as ever. Go talk to her. I'll not waste my time speaking with a petulant toy soldier." "Luciana clearly hasn't lost her charming demeanor. Predictable." Before the quest, when Fyr walks into the Chancel of Records to find you. Divayth Fyr: "There you are. Good. We have much to discuss." Neramo: "Divayth Fyr? here? It is a true pleasure to meet you." Divayth Fyr: "I imagine it is. Now, be on your way." Neramo: "Yes... well. Be seeing you, assistant. Good day, Lord Fyr." "So you're a citizen now? Well done. I heard something about a constable tossing people down sewer drains. Even in this shrine to knowledge, drooling idiots bumble their way to power. Ludicrous. Moving on, I require your services once more." "It's Sotha Sil. Shortly after you and I parted company, I sought him out to discuss our Daedric artifact. I fear something is... askew. His habits, his diction, the timbre of his voice- they've all changed, albeit subtly." You think something is wrong with him? "Worse. Initially, I dismissed it as boredom, fatigue, or even the first signs of senility. But now, after observing him at length, I can say with certainty- this is not the Sotha Sil I know. There's Daedric mischief here, and we will root it out." "We will leverage your hard-earned citizenship to make inquiries. First, I will make it known that in light of your recent exploits, I offered to take you on as my aide- an offer you so eagerly accepted." Fine. How does me becoming your aide help us investigate Sotha Sil? "As the most powerful mage in the Brass Fortress, I find it difficult to have proper conversations with common folk. They grow silent at my approach, then whisper as I leave. An appropriate, but sadly uninformative display of deference." So you want me to talk to the other aides? "Indeed. It's commonly understood that servants grumble about their masters, loudly, to those they consider equals. Ask them about Sotha Sil's recent behavior. I'm confident that we'll find something of value tucked away in their churlish complaints." All right, I'll talk to the other aides. "You have questions, of course. Ask what you must. The forces at work here are cunning indeed. You should be prepared for anything." I thought no one really knew Sotha Sil. How can you be sure something is wrong? "He is inscrutable, but he's also unflinching. Sil always most deliberately, quietly, and one step at a time—like clockwork. I have never once seen him divert from his course. Until now." "In the short time we've been here, he has twice adjusted city patrol routes and delivered three revisions to the fortress charter. Trust me when I say this is unprecedented. Sotha Sil never meddles like this." Has he made any other changes? "That's for you to discover. Don't bother speaking with members of the congress. Varuni's faith in Sotha Sil is unbreakable. Chancellor Gascone resents any threat to the status quo. And Luciana? Well, let's just say she's been less than helpful." Is Proctor Luciana still insisting you leave the city? "Luciana resents my presence, but she's no fool. I go where I please, when I please. An open confrontation between us would likely leave hundreds dead. So do not trouble yourself. She will not stand in the way of our investigation." What can you tell me about the others in Sotha Sil's circle? "Well, you've met Varuni. She's pleasant without being vapid or boring. Then again, her doe-eyed faith in Sotha Sil turns my stomach. I find religious attachments repulsive. My thoughts on Luciana are well-known. "Gascone serves as chancellor. He commands respect, but suffers from the peculiar character flaw of demanding praise at all times. Adulation. A sad fixation indeed. He holds great power, but it's his petty obsessions that make him dangerous. Be wary." "Were you treated well by the menials? I assume they battered you with complaints. What have you learned?" Sotha Sil is definitely behaving strangely. He's made lots of odd demands. "Well I could have told you that. That is why I sent you here, after all. What kinds of demands? Be specific." He makes the servants darken rooms before he enters, and demanded that some lamps be replaced. "The lamps in the loqutorium, yes? The large assembly room over there? The auxiliaries and factotums have been laboring in there day and night, ever since we arrived. Curious. What could lights have to do with this? There's only one way to find out." Expose him to the light? "Impressive. I assumed I'd have to explain it to you. Of course, this requires a functional lamp. I assume he ordered them destroyed. Speak to that High Elf of yours. Neramo. The Dark Elf as well. We need one of these lamps—repaired and operable." All right, I'll go find Neramo and Raynor. "While you investigate and acquire this lamp, I will make sure Sil stays off your scent. Keeping secrets in the Brass Fortress requires a spider's cunning and god-like vigilance. Luckily, you have me. Find Neramo and bring me that light." "Ah, I was beginning to worry. Not about you, of course. These apostles have been circling me like cliff racers- looking for an autograph no doubt. So tiresome. I take it you were successful in learning about these lights and constructing a new one?" Yes. Neramo and Raynor constructed a working lamp. Kireth will deliver it soon. "Well done. I assume you discovered the special property of these lamps? Why does my dear friend, Sil, go to such lengths to avoid them?" Neramo believes they emit some kind of invisible light. "Invisible light? Fascinating. To help with factotum navigation perhaps? No matter. Further inquiry must wait. Now is the time for action. I will request a congressional assembly. Plant your lamp on the balcony above, then return to me." All right. I'll get the lamp into position on the balcony. "Seems young Kireth brings ill news. Speak with her." "Kirith's logic is sound- keep those guards alive and position the lamp, just as we planned. You must move swiftly. Once I convince the others to call an assembly, we won't have much time. The Congress of Calibration is nothing if not prompt." 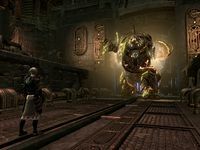 "I convinced Sotha Sil that the congress requires yet another lecture on the sanctity of clockwork automata. He eagerly agreed. Seemed almost giddy about it. It was... unsettling. Yes. I placed the lamp. Everything is prepared. "Good. Sil's lecture should begin any moment now. Stand ready to activate the lamp. I'm reasonably certain that something will happen, but the specifics elude me. I guess this is what uncertainty feels like. What a novel change of pace." "Well. That was enlightening. To think, I've been speaking to Sotha Sil's shadow all this time. It seemed so lifelike. Far more advanced than my own, I'm sorry to say. Fascinating. It really is too bad we'll all be dead soon." "I don't mean to alarm you, but I will be frank. If an imposter sits upon the Throne Aligned and learns how to wield the power of this place, a cataclysm will follow. We may yet discover a way to avert this disaster, but the chances are slim." "Stay with Varuni. With Sotha Sil exposed as an impostor, the congress will fall into turmoil. In such chaos, dark truths always float to the surface. Pray they do so quickly. I have other inquiries to make. Stay vigilant. We will meet again soon." Take care of yourself, Divayth. "Ah, my erstwhile companion. You look remarkably ... coherent. Most mortals caught in a Daedric tempest would suffer some lasting effects. I'm impressed. Baffled, but impressed." Sotha Sil asked me to find you. "Already? I expected him to wait at least a week before summoning me. Sil's concept of time bears only a faint resemblance to our own. You should set out. I'll be along shortly." Where were you? Luciana and I nearly died fighting the Shadow. "You didn't though. Bully for you. In truth, I sought an alternate route to the throne—through the Evergloam. Unfortunately, Nocturnal detected my presence immediately. One of the few burdens of near-divine power. I'm difficult to miss." Fortunately, Nocturnal's attention turned to you and the good proctor when you defeated the Shadow. It gave me the opportunity to pinpoint the object of her fury. You. I followed her to the throne. The rest is history." What are you doing out here? / Fine. So, what are you doing out here? "Taking it all in, I suppose. Surely, you won't begrudge me a moment of vulnerability. This place ... it is something. I sense that I won't return anytime soon—if at all. When you've lived as long as I have, that actually starts to mean something." What's to keep you from coming back? "One can only marvel at a rival's triumphs for so long before that awe turns to resentment, and I have no time for petty jealousy. I have plans of my own, and countless realms to explore. I can't afford to linger anywhere for long." When added in Update 14, Fyr was originally wearing Xivkyn style armor. 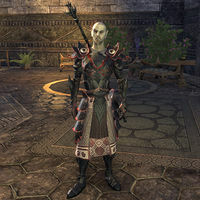 Following Update 16, his armor was heavily changed to the Telvanni Master Wizard costume. Divayth Fyr is voiced by JB Blanc, who also did the voices for Sheogorath and King Kurog. This page was last modified on 18 February 2019, at 16:07.